There’s nothing nicer than receiving a foodie gift made with love – like these tasty vanilla shortbread. Take some time out to make a few batches of this delicious shortbread and package them up in pretty boxes or in gift bags tied with festive ribbon and you’ll be welcome at any Christmas gathering! I love Christmas – especially the build up and the anticipation, and of course the food! It’s a busy time in the Hey Pesto! kitchen so my blog has been a little neglected so I thought I should do a quick update. We’ve had great fun with our Christmas demos complete with chocolate cottage construction challenges which were great fun ! By the way we have one more evening class on Tuesday 8th if you’re looking for inspiration for Festive Party Food! 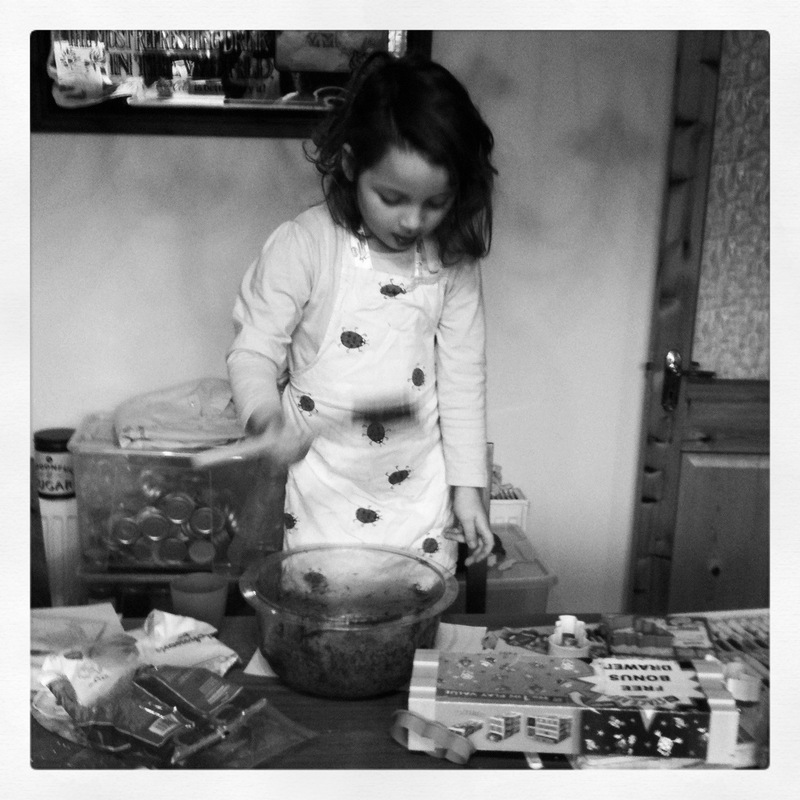 Happy New Year and all that …..
2013 was exciting, if a tad stressful – the best bit being moving house and installing not one but two kitchens – one for me and one for Hey Pesto! Now I have no excuses so it’s time to start making plans for the year ahead……..
concentrate on the ‘cookery school side’ of the business – starting with my lighter cooking course on 14th January. I’ve been blown away by the feedback from my classes so far and I can’t believe how much I love doing them. continue to grow my catering business. I can’t believe it’s 9 years since I started Hey Pesto! enjoy lots of good food in the company of good friends and loved ones. So my first meal of 2014 is going to be a Vegetarian Crumble to use up all the sad vegetables still lurking in the pantry. Add the garlic, spices and ginger to the onions, cook for another minute then add in 2 tbsps of passasta. Cook for another minute then add in the rest of the passata. 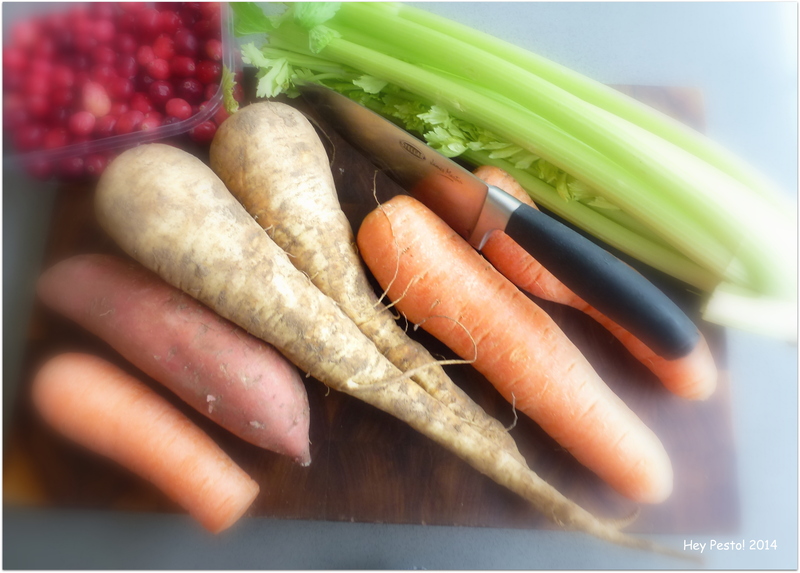 Add in the chopped vegetables – I used carrots, celery(not a root veg I know but it was in the basket), sweet potato and parsnips. 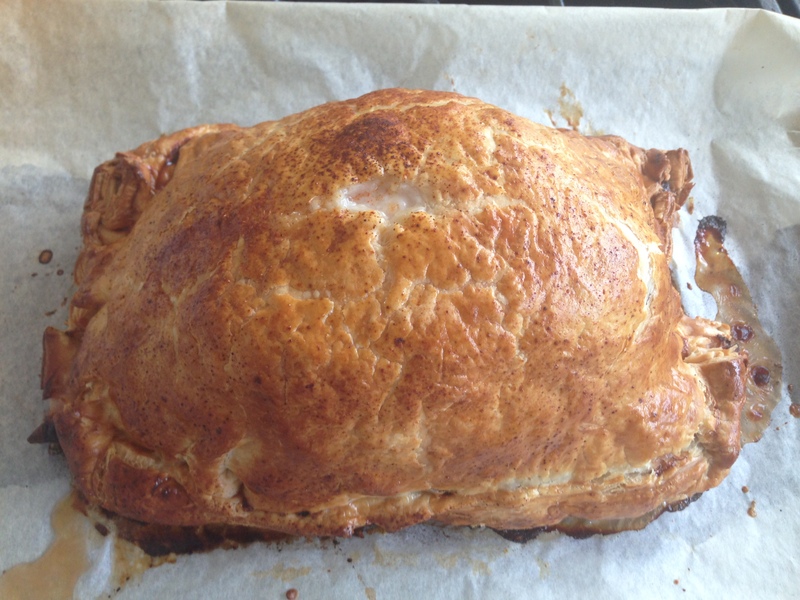 I also threw in the half packet of chestnuts that were languishing in the fridge since I made turkey & leek pie. 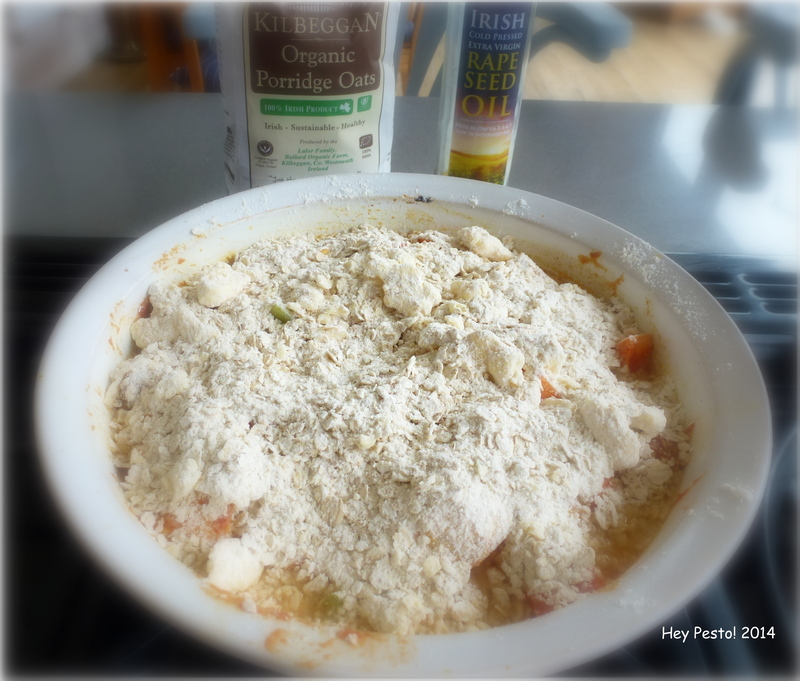 Transfer the mix to a casserole dish and pour in your vegetable stock. Make the crumble topping by rubbing the butter into the flour and oats. Add in the cayenne pepper – both for colour and seasoning. You could use paprika if you prefer. 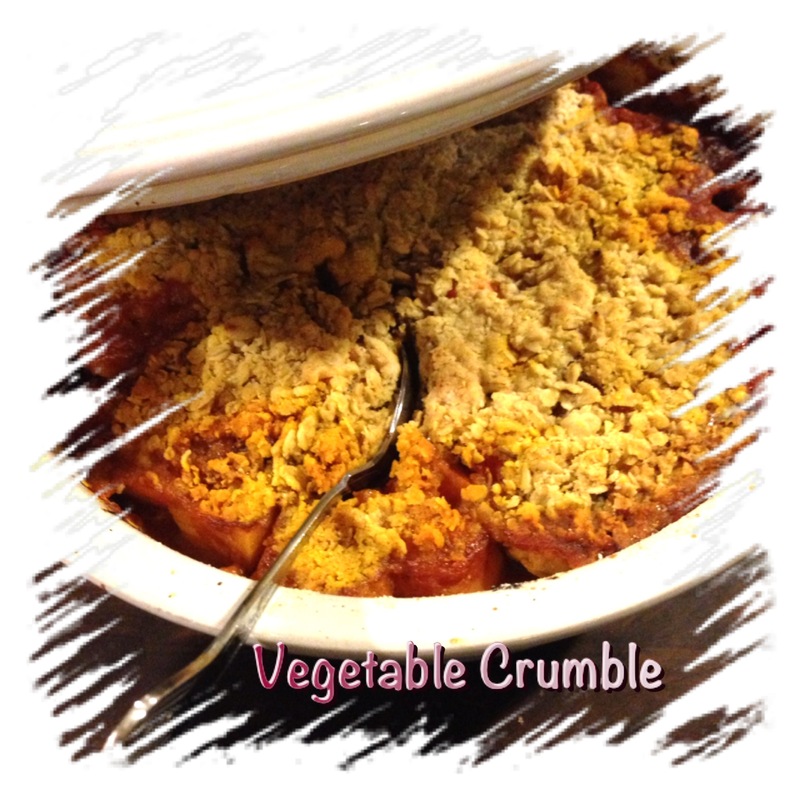 Top the vegetables with the crumble mix and bake for 30-40 mins. until the top is golden and bubbling. My dish is ready to go into the oven but as it has stopped raining I may even attempt to go for a walk! Looking forward to dinner later with a nice glass of red wine – well it is still Christmas …. Happy Cooking and Happy New Year! PS What are you planning for 2014?! This is how the Crumble turned out and if I do say so myself it was rather tasty! When I was in college and living away from home for the first time I decided I would become a vegetarian. I have to to say it was more from economic than altruistic reasons … that and the fact I had a major aversion to handling raw meat! During my years as a vegetarian I drove my poor Mum mad every Christmas by refusing point blank to touch turkey or ham and insisting on cooking my own dinner down to the vegetarian gravy! Over the years this nut roast became a Christmas favourite tradition and even my very carnivorous brother gave it his seal of approval. So if you’re looking for a veggie option for Christmas Day then your search ends here………. 8 oz/ 225g mushrooms, sliced. In a large bowl mix nuts and breadcrumbs together with the beaten egg. In your pan sauté mushrooms in butter until soft. I always add a little sherry or vermouth at this stage…. it gives a lovely flavour! Butter and line 2 lb loaf tin. Put a line of your best mushroom pieces down the middle of the base – this will be the top of your roast when you turn it out so make sure they look good! Then press in half the nut mixture. Cover with a layer of mushrooms and top with rest of nut mixture. 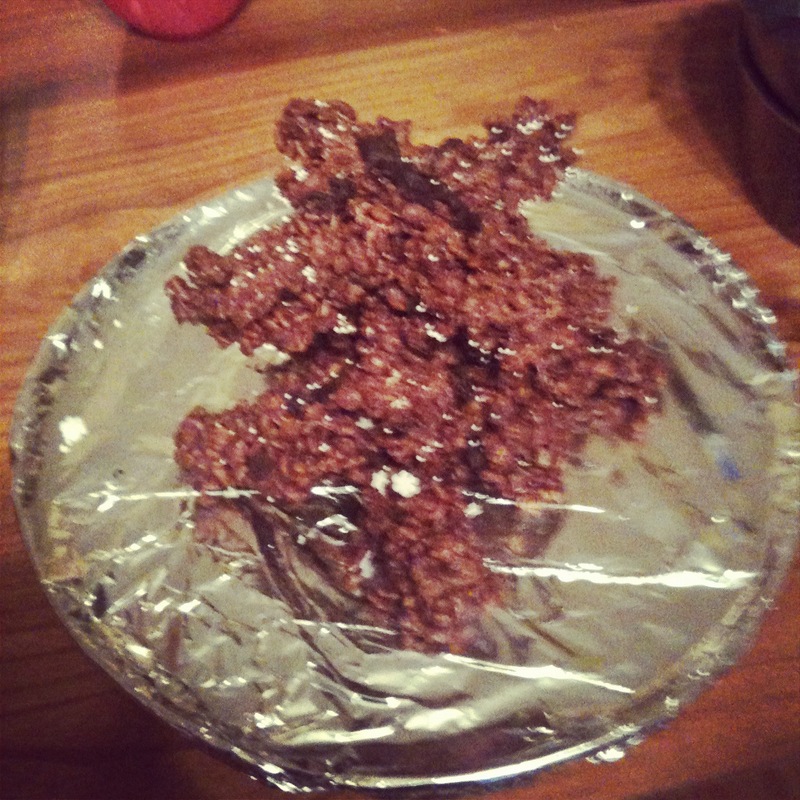 Cover with foil and bake for 1 hour. When cooked remove from oven and allow to stand for 10 mins before turning out. Serve it hot with all the usual Christmas accompaniments or have it cold with salad and chutney. And if you’re looking for a delicious vegetarian gravy …….. all you need to do is put 1 pt/500ml water, 2 tbsp soy sauce and 2 tbsp redcurrant jelly in a saucepan and bring to the boil, stirring to dissolve the jelly. 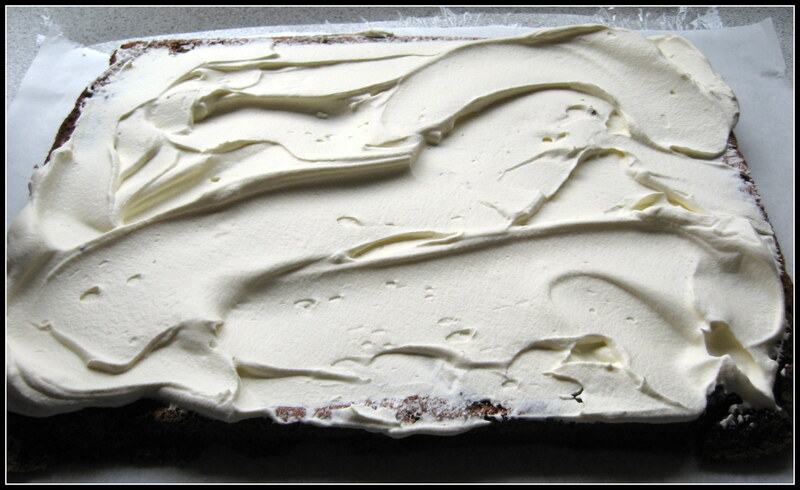 Blend 2 tbsp cornflour with 2 tbsp orange juice and 1 tbsp sherry. Stir a little of hot liquid into cornflour mix, then add back into saucepan, whisking well to ensure no lumps! Simmer over gentle heat until slightly thickened. Season to taste. Happy Cooking and Happy Christmas! It’s that time of year again. Time to plan the Christmas Feast – turkey, ham and all the trimmings. I don’t know about you but I’ve always found turkey rather dry despite trying all sorts of methods including cooking it in buttered muslin, breast side down, basting………….Then last year on our Fáilte Ireland food trip to Canada I had my eureka moment when we were treated to a Thanksgiving dinner in the lovely Elmhirst Resort – Brining! Bring the salt, sugar and 1 litre of water to the boil, stir until dissolved, turn off the heat and add the remaining ingredients and 6 litres of cold water. This brine mix will work for up to a 16 lb. turkey. This year we’re having turkey wellington for Christmas Dinner . I’m going to brine a turkey breast for 48 hours, then remove it from the brine, split it in half (not going quite the way through ) and fill the ‘pocket’ with stuffing. Then I’ll spread two sheets of puff pastry with cranberry sauce ; place turkey on one sheet and top with the second – sealing the edges together. To finish I’ll brush the pastry with beaten egg and cut a little cross in the top to allow steam to escape. My rule of thumb for cooking this is 20 minutes per pound plus 20 minutes. This is one I prepared earlier ! Melt butter in frying pan and sauté onions until soft but not coloured (about 5-10 mins). Stir in apricots, breadcrumbs, zest, juice and parsley. Remove from heat. Allow to cool completely before using to stuff your bird. Make sure when you’re brining your bird to keep it in the fridge or somewhere cold. If you don’t have a meat thermometer use a skewer in the thickest part leg and breast – make sure juices run clear. Save yourself time and prep your veg day before! Looks aren’t everything when it comes to Christmas Trees, especially the chocolate variety! I can’t believe it’s 9 years ago since I did the 12 week course in Ballymaloe Cookery School! 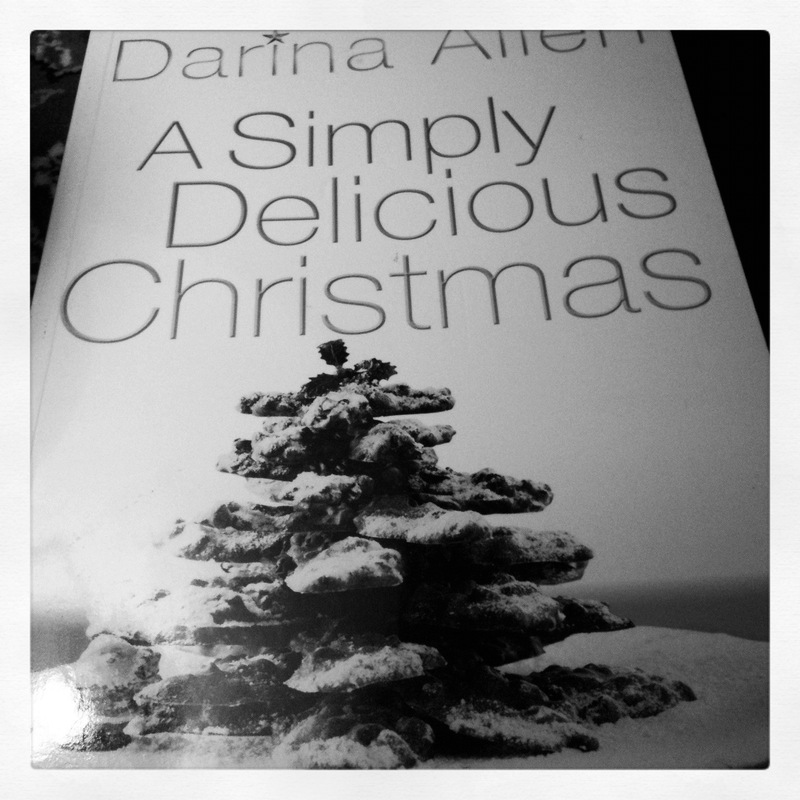 After the stress of the exams and as a parting gift Darina gave us signed copies of her Christmas cookbook. 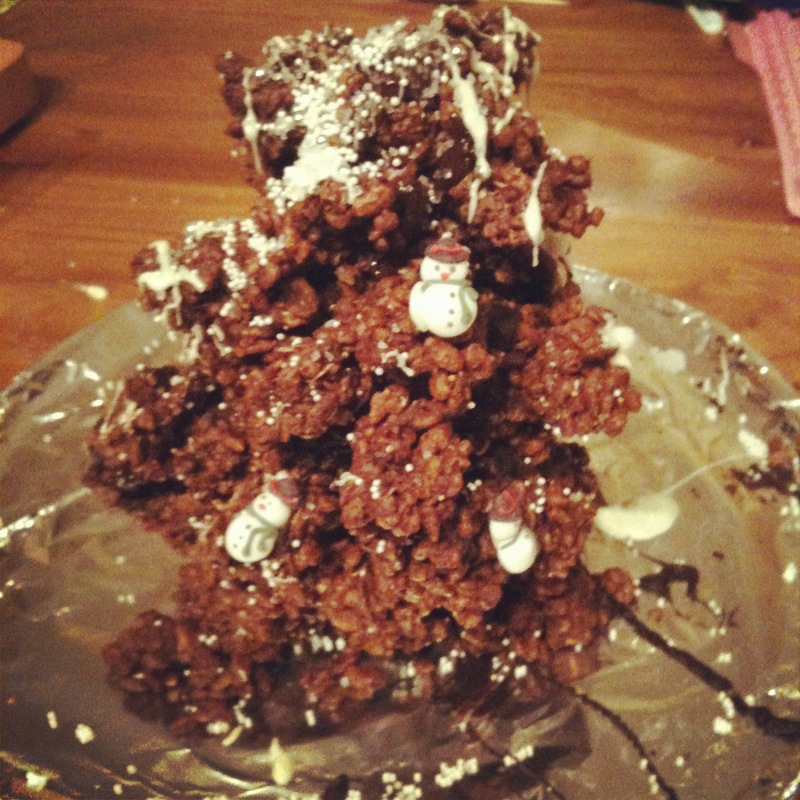 In my enthusiasm I decided that straight away I had to make the cover recipe – the Chocolate Christmas Tree. Why did I try ? – it was incredibly fiddly and I think my language may have deteriorated over the process! 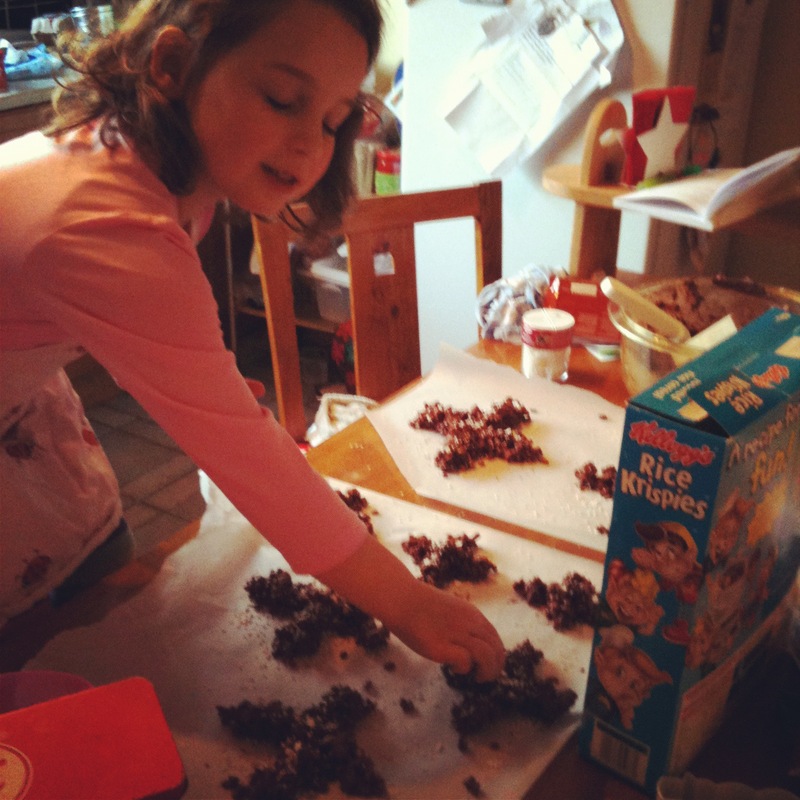 At that stage I was still insistent on boiling and peeling almonds and hazelnuts……. That it was a very expensive tree and my family did not fully appreciate my efforts! 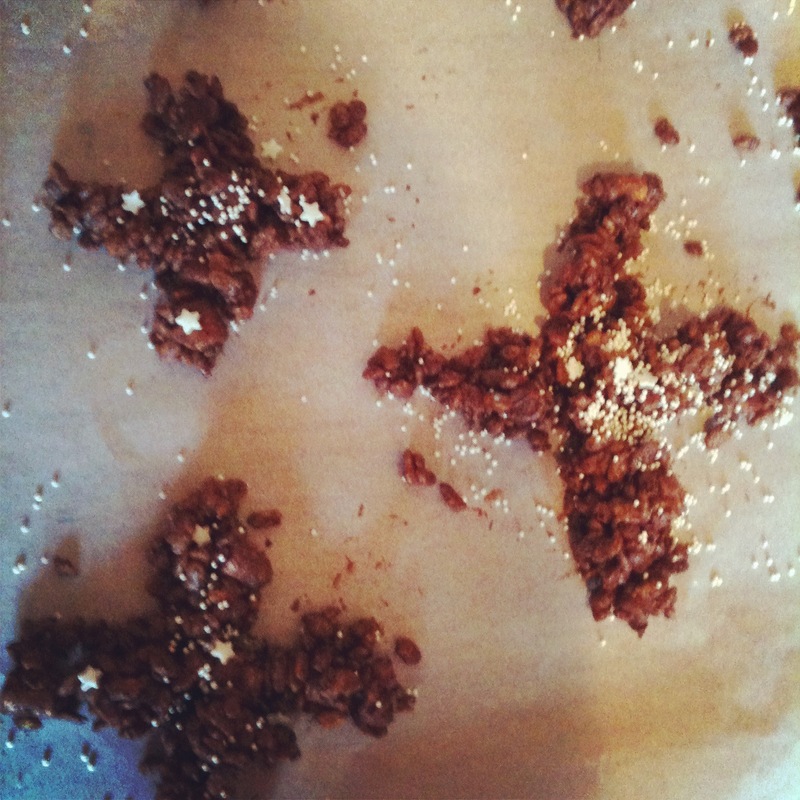 I had marked out parchment paper with 8 crosses for the tree branches – 7cm, 9cm, 11cm, 13cm, 14cm, 15cm, 16cm and 17cm. The engineer in me loved this bit and even dug out my scale rule to make sure all measurements were accurate. The junior chef took the opportunity to make a Christmas card for her parents. We ‘glued’ each branch in place with the melted chocolate – this is where my nerves got a little fraught as some of the branches drooped. Darina suggests supporting the branches with matchboxes until they set – I only have a large box of matches for candles so that wasn’t an option! I should point out at this stage the junior chef was very busy – licking the bowl!! The best part - licking the bowl... and the spoon! 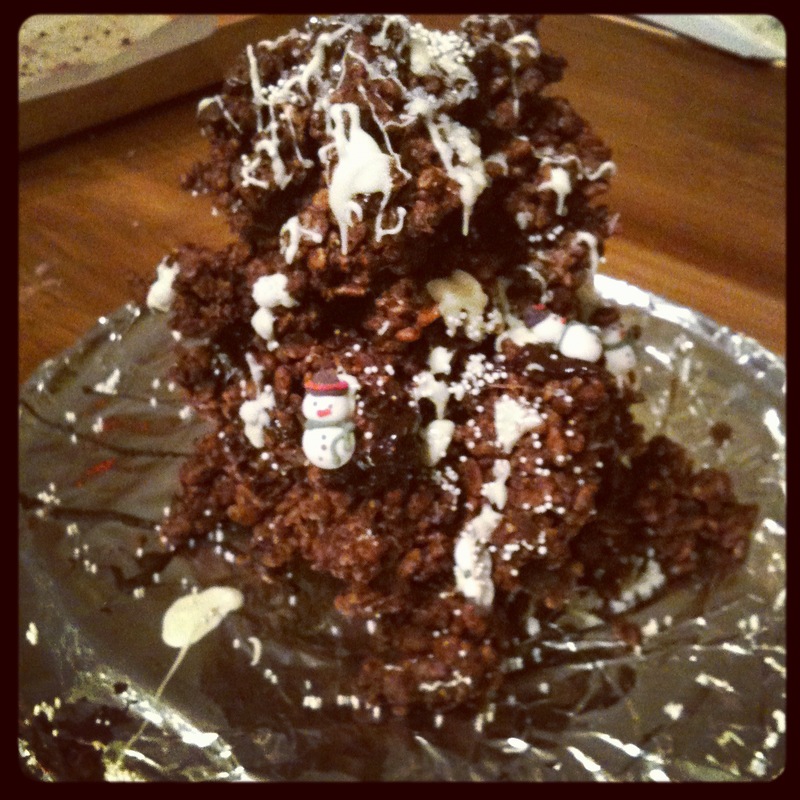 We finished off the decorating with melted white chocolate, sparkles and mini snowmen….but at this stage between falling branches and sneaky tastes by the junior chef we decided to rename it a chocolate mountain!! Nana came to visit for tea as did the Junior Chef’s Daddy who came to collect her and her baby brother aka Taster No 2! 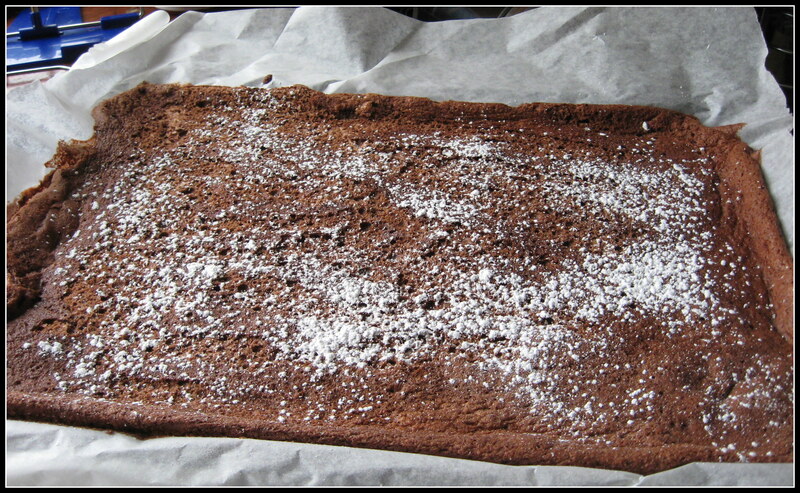 The cake may not have looked like the one on the cover of Darina’s book (as Junior Chef pointed out!) but I’d just like to say that there’s very little of it left! Maybe, just maybe, I might try another tree before Christmas……….. 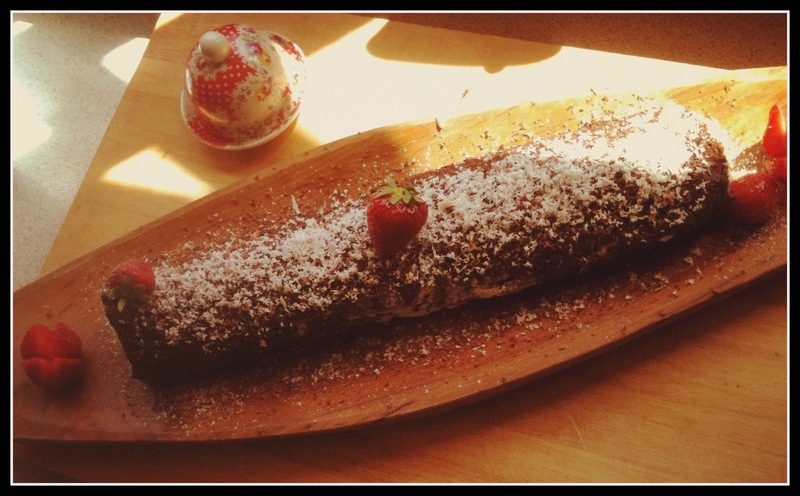 When I was researching recipes for last Christmas I came across this recipe in an old Christmas magazine (I think it was Good Food) – I didn’t get a chance to try it at the time but I have used it for dinner parties during the year and it’s divine! Definitely an option for Christmas dinner if you don’t want to go the traditional route of turkey and ham…..
Heat butter and a little olive oil in large frying pan (the oil will prevent the butter burning) and cook shallot and garlic for 3-5 min, then stir in chopped porcini and cook for 2 mins. Add chopped mushrooms and thyme.I usually add a dash of Madeira at this point too! Cook for 10 mins until lightly browned and any liquid has evaporated. Season to taste. Leave to cool. Spread the mushroom mix over the surface of the meat then roll it up tightly like a swiss roll. Tie it with string to hold the shape. You can leave in fridge overnight if required. Heat oven to 200 C/180 Fan/Gas 6. Sear the rolled fillet in roasting pan with oil and butter. You can add some shallots to roast around the beef and add some extra whole mushrooms about 10 mins before the end of cooking time. Make sure to rest meat for about 10-15 mins before carving. 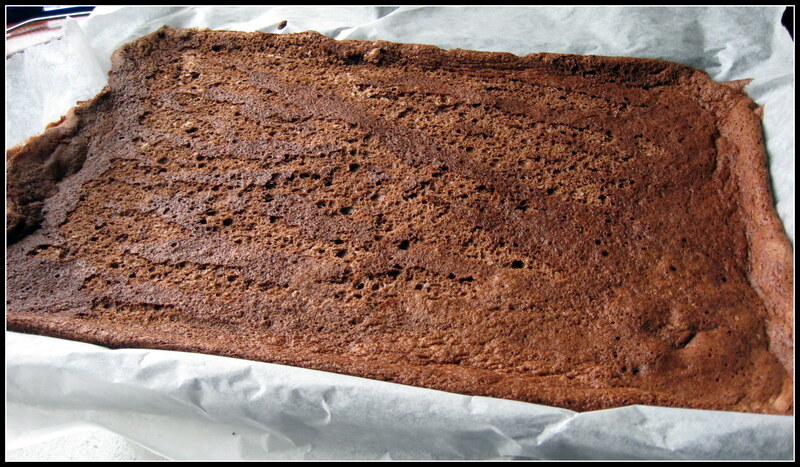 Put tray back on hob and stir in 1 tbsp cornflour, and pour in 3 tbsp Madeira (you can use Brandy either but it’s safer not to pour directly from the bottle!). When madeira is almost boiled away add in the reserved mushroom liquor and 400 ml beef stock. Cook for about 5 mins, srain and then stir in about 100ml cream and cook for another few minutes. Season and add some chopped parsley. We served the beef in a steak-sized slice on a bed of celeriac mash with the sauce spooned around the mash and on another occasion with caramelised beetroot and green beans. 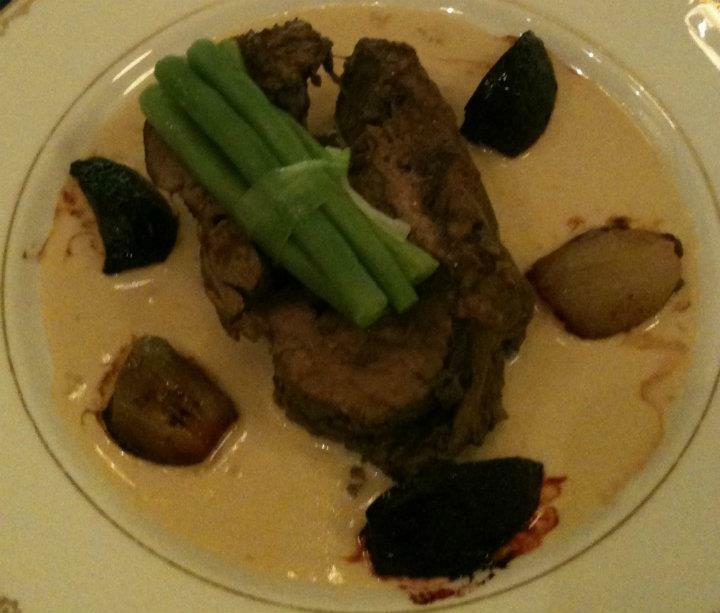 This is the only picture I can find of the dish and I apologise for the poor quality of the image but believe me it is an amazing dish and worth the effort! PS thanks to @Murpheroo on twitter for reminding me of this great recipe!